In contrast, another bathroom is lined with slate strips, and features a freestanding bath, a built-in medicine cabinet with a wenge frame, and four niches which add some depth to the room. Please could you tell me where I can find the basin? Hi. It's from a company called Laufen (I also work for them) and you can find it in our Alessi range. Please can you tell me what plants these are. They look great. I'm not an expert on house plants but it looks like Ficus pumila 'Variegata' or it could be Soleirolia soleirolii (Baby's tears) which can be grown indoors or outdoors. Hope that helps. You can probably buy it only from someone like Crocus or your local garden centre. Beam widthsLED lights, both integrated and retrofit, come in varying beam widths. You can think of beam width as the size of the cone of light the fitting produces. Smaller beam widths, such as 10 degrees, are perfect for highlighting a focal point. Around 20-30 degrees work well for downlighting in higher ceilings, and beam widths of 30-50 degrees provide a more diffused light, which is good for lower ceilings and niches. Experiment with slate Slate is smart, durable and naturally good looking. It’s a staple on floors, but if you’re in the market for a darker alternative to everywhere-white, its charcoal tones also look interesting and upmarket on walls. 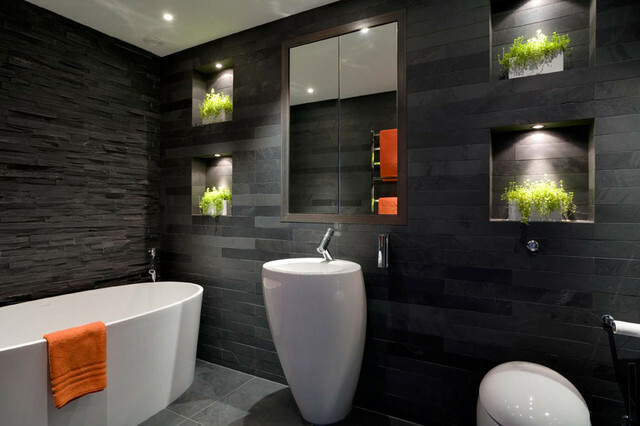 Slate tiles come in a variety of shapes these days, too, including these slim numbers.